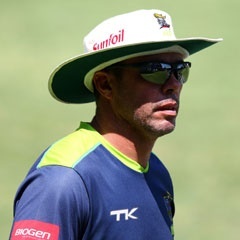 Cape Town - Knights coach Nicky Boje refuses to believe there will be any extra pressure on his side as they begin their Sunfoil Series title defence against the Cape Cobras starting at the Mangaung Oval in Bloemfontein from Tuesday. The match will mark the official start of the 2017/18 season for both sides with the hosts keen on a strong start as they bid to defend the four-day title. With the other five teams in the competition desperate for improving on last year, the Knights will be the team they hope to topple. “No not really (there’s no extra pressure),” Boje said ahead of the game. “We’re just going to go out there and try to play the same type of cricket that we played last season, which is the type that won us the title. “We’ll be positive as much as we can and just try and put all the processes in place for every game. While the Knights were winners last season, opponents the Cobras came third, but only after a splendid second part of the season when Ashwell Prince was appointed as coach. Prince, meanwhile, has his first full pre-season as coach of the franchise. The former Proteas batsman has been particularly pleased about time spent in Oudtshoorn recently after a cold winter in Cape Town. “We had a nice little camp there where we managed to get some invaluable time playing on grass,” he said. The Knights have a few new faces in their squad with Eddie Leie particularly standing out after joining from the Highveld Lions. The Cobras, who recruited Temba Bavuma in the winter, have the Proteas batsman available, along with fellow national star Hashim Amla. Knights squad: Ottneil Baartman, Mbulelo Budaza, Werner Coetsee, Theunis de Bruyn (capt), Eddie Leie, David Miller, Luthando Mnyanda, Grant Mokoena, Duanne Olivier, Keegan Petersen, Rudi Second, Pite van Biljon, Shadley van Schalkwyk. Cobras squad: Hashim Amla, Temba Bavuma, Simon Khomari, Pieter Malan, Dane Piedt (capt), Aviwe Mgijima, Tshepo Moreki, Justin Ontong, Dane Paterson, Andrew Puttick, Jason Smith, Kyle Verreynne, Lizaad Williams.